Use PackAware to track position, detect hazards and problems of your important cargo. Get real data and share it. Already joined packaware? Sign in. Say goodbye to lost and damaged packages and costly delays. Yepzon Coco is industrial grade tracking device designed in collaboration with positioning experts of Yepzon for use with PackAware service. Its advanced sensors help you find problem areas in your supply chain. Monitor position (GPS/GSM cell), temperature, humidity and collisions (acceleration). Always get the latest information thanks to near realtime global communication via 2G mobile networks. See up to date locations of your packages instantly. Analyze package route and places that cause delays. View raw data collected by tracking devices. Receive notifications to stay up to date on important package events. The mobile user interface provides camera based barcode reader to make packing super easy. Use acceleration, temperature and humidity data to detect potential damage to your packages. Use GPS and GSM cell location data to find missing or stolen packages. Use data to identify problem areas in your delivery chain. Set targets dates for deliveries and be notified when delivery has missed. Use temperature, humidity and acceleration data to learn about environments your cargo spends time in. Tracking devices work globally via mobile networks. No SIM cards or additional infrastructure required. Keep organized by adding package list and other relevant documents to the packages. Keep your customers informed by sharing the package location. Use our REST API to integrate the collected data into your systems. Sign in using your existing Microsoft work accounts or get new accounts via invite system. Avoid spending hours emailing or in the phone to find your packages. Just sign in to PackAware. We fully manage and host the service so you can focus on your business. We've opened a new online store where you can purchase tracking devices and in the future other services too. Orders can be paid by credit & debit cards, but we're looking into adding other payment methods such as invoice in the future. Please remember, our sales team is ready to help. With the new Feedback and ideas page our users are able to better express their feedback. As the feedback is tracked in a ticket it doesn't get lost and we can keep you updated on the progress we're making. 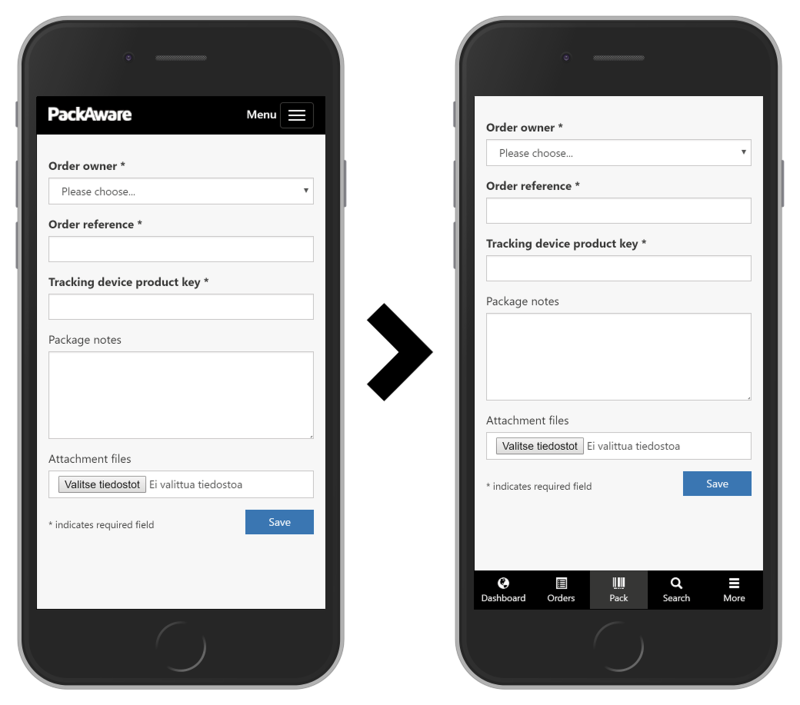 The improved Service updates page enables us to keep you informed about the changes we make to PackAware. Both of these features enable public discussion and allow automatic email notifications via the GitHub platform. Improved navigation experience in the mobile user interface. See example. Share the latest location of an order using a link. See documentation. Please contact us for any feedback regarding these features. Important cargo on the way? And you don’t have any reliable information about its current location or conditions it has been exposed to on the road? Don’t worry – we have the solution for you.